Happy New Year's, everyone, from the Underwoods down under! Dave made a new discovery for us--he was sure we'd been holding out on him but, indeed, we'd never heard of Florida's Warm Mineral Springs south of Venice about 20 miles...who knew! Not really knowing what we were up for, we ventured out for the day and discovered a very relaxing way to spend the day. We eased around the 80-degree water "sinkhole," occasionally emerging for a trip to the restroom or European-style restaurant. Then, back we'd go again for another dip with a "noodle." The mineral waters had a strange, healing effect as well as a bouyancy...we'll come back again for another day at the spa. Has the BEST Fried Mac 'N Cheese ever. Has the NEXT BEST Mac and Cheese with BIG noodles and a crispy bacon-bit topping. Rated third on the list...not the best Mac and Cheese in town but it has a PIER. I love going out to the pier! Birds fly right through and we like to see people fish. It's been a cooler-than-normal season...Allen heard it was colder in Jacksonville, FL than it was in Madison, WI for the University of Wisconsin vs. Miami game...he doesn't know if it was true or not. For yesterday's boating day, it was a brisk 60-something on the water but the sun was shining and we had a wonderful day in the open air. Today we're heading south to Gasparilla Island for a day on the sand. It'll be 70-72 degrees so we'll be able to take off our Viking stocking caps. Hunter and Blake made a Frosty that will stay. Some magnets and a little construction paper, hot glue and scissors get it done! Today, we're heading out to the Food Pantry and a little more work on our restaurant reviews...stay tuned. For some reason, the guys are nuts about banyans and we always need our pictures taken in them. On Saturday (Family Day at the Ringling Museum), we visited the circus museums, the mansion, the gardens, and the galleries. High point of the day was the art gallery that contained craft projects for the boys--they made Venetian stuff: gondolas, masks, gothic chairs, and gold boxes. Last stop was the gift shop where they consumed a circus cannon that shoots someone out and a crafts book filled with Ancient Egyptian things. Lesson for the Day: If you stay too long in the banyans, they'll grow right around you. The Underwoods have driven to Florida in their new Highlander, stopping on the way at the Lousiville Slugger Plant. There they picked up personalized bats styled in the fashion of their favorite players. We've been activity bound for the last few days, lots of beaching, sand in the crotches, and time spent outdoors in pleasant weather. It rained on Christmas morning, thanks to that big storm up north (we always get the tail ends of those systems) but things have dried up a bit and we'll be back outdoors tomorrow. 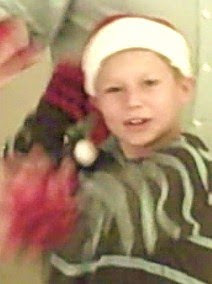 Hope your Christmas Day was a success and you're all warm and fuzzy with good feelings. 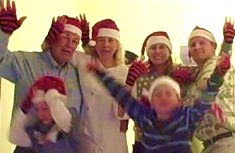 We took a video with lots of action but the Jerdee computer wouldn't take it on...so we've produced a still of us saying "Merry Christmas" in our Santa hats and gloves designed perfectly for texting. Consider yourselves texted. 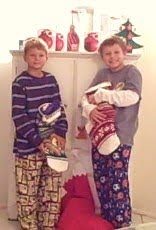 These guys are still playing along with Santa...they've just ransacked their stockings...lots of games to play in the next few days. Two books have now been completed for Christmas gifts...Both Hunter and Blake wrote stories about friendships. Hunter punches the holes in the cover and signature before they're stitched together. Hunter uses a bone folder to crease the signature of 12 pages. Hunter's rough draft about Dragon. Blake's book about an imaginary shark who befriended him. Blake decorates the cover with stick-on shells. 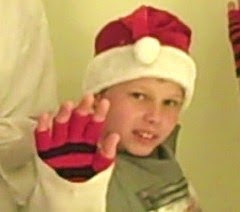 Hunter's 9th birthday gift from his grandparents was to spend 24 hours with them in any way he would like. He replied to this opportunity with a request for going to "that island in Florida where they have cheeseburgers" (he's such a foodie). So that's what today was all about--a trip to Cabbage Key and the chance to eat a cheeseburger in Paradise. Here are a few highlights for the day. The Tropic Star, built to resemble the African Queen, awaits our departure. Riding the Tropic Star was an easygoing deal...these antsy boys could move from bench to bench because the crowds aboard were thin, thanks to the stew of storms going on further up the northern coast that caused cool weather in the south. Merry Christmas from Cabbage Key Inn where Hunter and Blake dined on the storied "cheeseburger in paradise" amidst walls plastered with dollar bills. After lunch, the Tropic Star took us to Cayo Costa State Park where we could enjoy the beach. 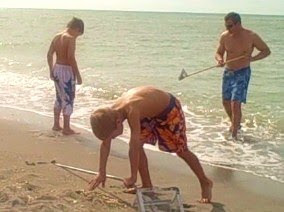 This picture illustrates the Shark Tooth Walk. You walk along the beach in this hooked position, searching the sands for small black teeth. Today the guys picked up 24. Last Stop: The Sandy Hook restaurant for a seaside dinner of mac & cheese. The new book is called Dragon. Hunter's hard at work writing a 12-page book on the computer. Once we have his pages printed out, we'll cut and paste the pages until they're ready for a double-sided print on 11x17 paper at Fed Ex. He's drawn some illustrations for a few designated spots. Blake has written his book already, printed it out at Fed Ex and is now punching the holes in preparation for stitching the signature together. Covers too. 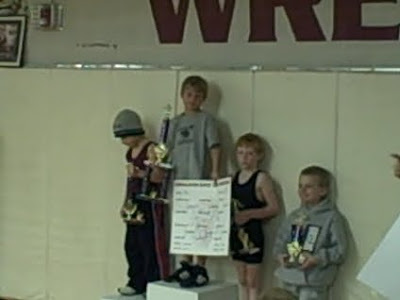 First Place at Oskaloosa. Blake was announced "Blake Underwood out of Pekin". He was wearing a Pekin t-shirt his grandparents gave him. Since his grandparents came up for the tournament it was all good. Kim and Adam always take a trip to some corner of the state of Iowa in October. This year we went southeast. 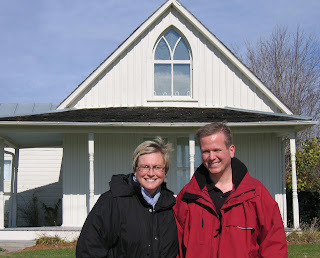 On our way home we went out of our way to stop by the setting for Grant Wood's American Gothic painting. Unfortunately the visitor's center was closed at the time, so no pitchfork. Of course we both look a little too cheery for the part. 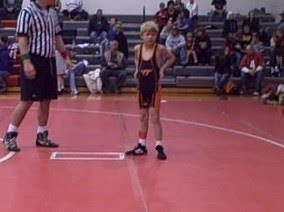 Blake started his 2009-2010 wrestling season off with a tournament at Amy's hold High School in Huxley. Here he is lookin' tough in his new Valley Tigers suit. He started the night off getting pinned and ended it pinning someone else. He will be going to Dave's old stomping grounds tomorrow. He plans to start off a little more alert this time. 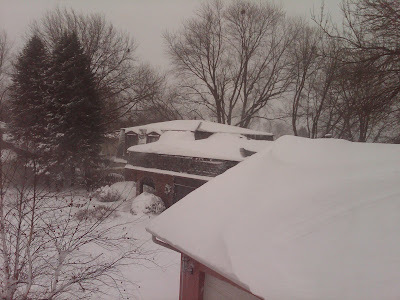 Dave ventured outside to shovel the 3 foot drifts of snow from the driveway. I went to help. Then up walked Channel 5 News asking if they could interview us. I suddenly had a case of "no way" and went inside. 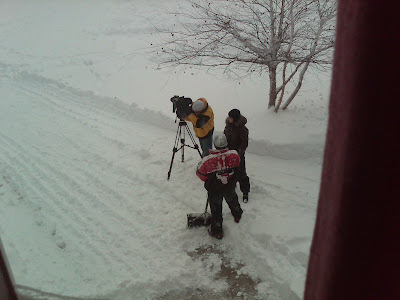 Really --- my 5 minutes of fame on camera shoveling snow in construction boots and a stocking hat? I will save it for a better occasion. Below you see Dave being asked about how much fun he was having. Next they moved to the kids that are just behind the camera guy in a very large snow fort. No dull moments here. 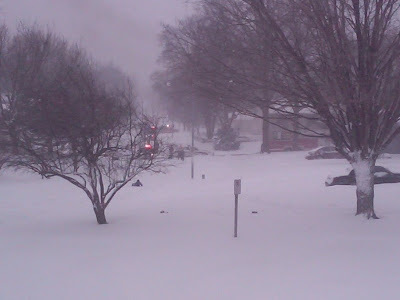 So Amy has shared some pictures of the snowstorm aftermath, here is a video from the other side of town. Narrated by Kimberly. Sorry for the long delay, it took a while to upload and we lost our power on Wednesday. A little new action has developed on our street. We now have a house fire. 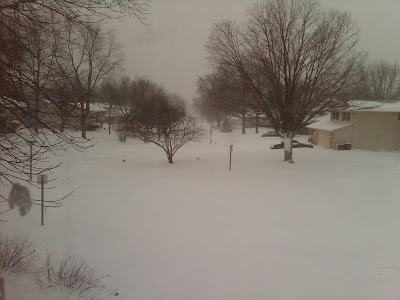 It is hard to see it through the blowing snow as the snow looks a lot like smoke. The kids are out scouting the story. We each have a window staked out. They finally called in the National Guard. I don't know if that is as amazing as the fact the Goodrich plant closed. It was so nice that Dave and I both had our Blackberries and remotes next to the bed this morning. See Blackberry photos below taken through the window. We are all home and not going anywhere for a while. Hmmm... I wonder what we have in the kitchen. They are measuring somewhere around 16" of snow at this time. If we can get it up to 17" we break a record set in 1888. It is so exciting to be making history. Last night, in the middle of this picture you would have seen Dave and a couple neighbor guys pushing a Trans Am that a high school kid foolishly tried to drive down our street, a UPS truck that had wandered off the main road and got stuck, and finally lots of lights flashing as someone had a very serious accident. It looked like they ran off the road into a tree. We don't know the details yet, but an ambulance did take someone away. Pretty good action for a small side street on a Tues night. The boys got up at 7 am asking if they could go out and shovel snow. There are 35-60 mph wind gusts and -15 wind chills so we said no. Hopefully, they will still want to dig in later. Adam and Kim. Any excitement on your side of town? We didn't wait for the Underwoods to arrive before buying a Christmas tree this year--the bargains were too good. Last year Amy paid $50 for the tree at the Shamrock House where we celebrate Christmas. This year we paid $27 for the same height in a tree...different tree, perhaps, but it's now in a new space on the Shamrock lanai, spreading its branches, drinking water, and waiting for ornaments. We worked on the lanai floor to make more living space and a bigger place for the guys to do their morning exercises. After a 3-hour session of cutting down our forest of bamboo (we had extended chain saw help from our lawn maintenance couple, Bill and Sue), we treated ourselves to lunch at Pop's where the queen egret rules the roost. Kim, Adam, Dave, Amy, Hunter and Blake celebrated an early Christmas by going to the Cirque Dreams: Illuminations show in Des Moines. This is Adam's first attempt at making a video, pretty crude and short. No, we did not record the show, sorry. A little beauty to counter the ugliness that surrounds us.